CG&S can supply you with all types of splines: O.D. fit, side fit in American National Standard Involute, ANSI B92.1 1-1970 etc, Metric DIN 5480, DIN 548, Serrations SAE & Metric DIN 5481 & all the Straight Sided Spline sizes & fits. CG&S uses the latest in spline generating equipment, coupled with calibrated inspection equipment and proven inspection techniques. 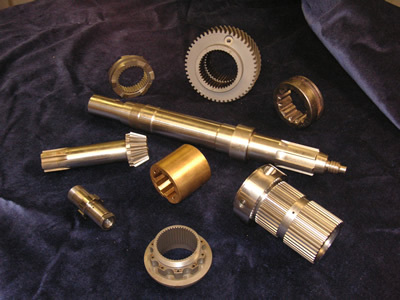 Our customers enjoy a level of trust in our abilities that is hard to find with other custom gear & machining companies. A mining equipment builder came to CG&S with the problem of premature spline shaft failure with their equipment while on the job. We had them send us sample parts along with their drawings for us to inspect their parts against their drawings. With our proven inspection methods, we found several problems by using our highly sophisticated reverse engineering methods. Our methods found that their present gear supplier had miss interpreted their drawings and were cutting side fit splines, where as the drawing dimensions were for O.D. fit splines. The result—no more tests were necessary. We wrote a quality plan for our potential customer, CG&S was awarded the contract and our mining equipment builder has been digging up gold ever since.